For those who are old enough to remember, Washington's Mount Saint Helens is famous for its deadly eruption in 1980 which claimed 57 lives and devastated much of the surrounding wilderness. The mountain has long been on my peak-bagging radar, but between the long drive, the need for permits and the seasonal quotas, the logistics for organizing a climbing trip there can be a little daunting. An opportunity to climb the mountain came up recently when I was planning a week-long spring break holiday at the end of March 2019 with Zosia Zgolak. I had previously ordered some items from Amazon.com but had them shipped to my brother in Seattle in order to save on some exorbitant shipping costs. Furthermore, my brother's birthday also happens to fall on the last week of March. These two reasons provided a good excuse to drive to Seattle, but it also meant that we could squeeze in some skiing along the way. 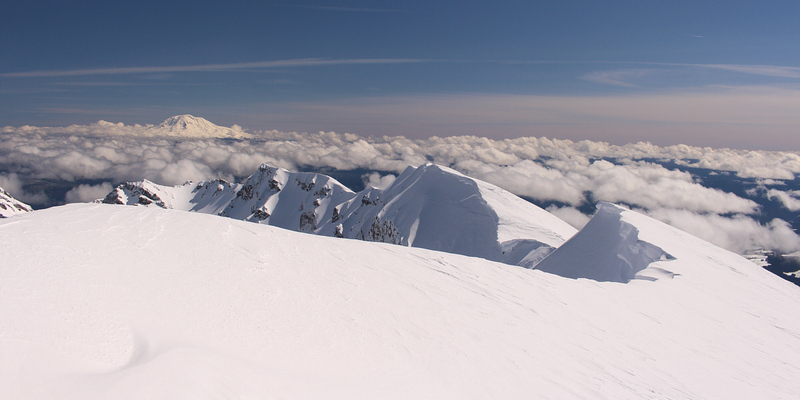 I proposed the idea of skiing Mount Saint Helens via the Worm Flows Route to Zosia, and after doing a little online research, she agreed that it would be worth a try. 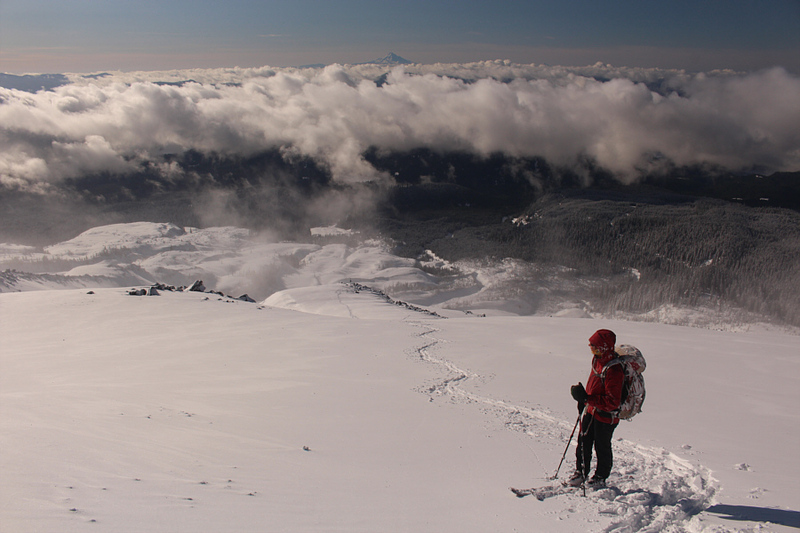 There are some things to consider when climbing Mount Saint Helens in winter and early spring. From December to March, a Sno-Park permit is required to park at Marble Mountain Sno-Park, the winter trailhead. From November to March, there are no quotas, and climbing permits are free and self-issued at the trailhead. 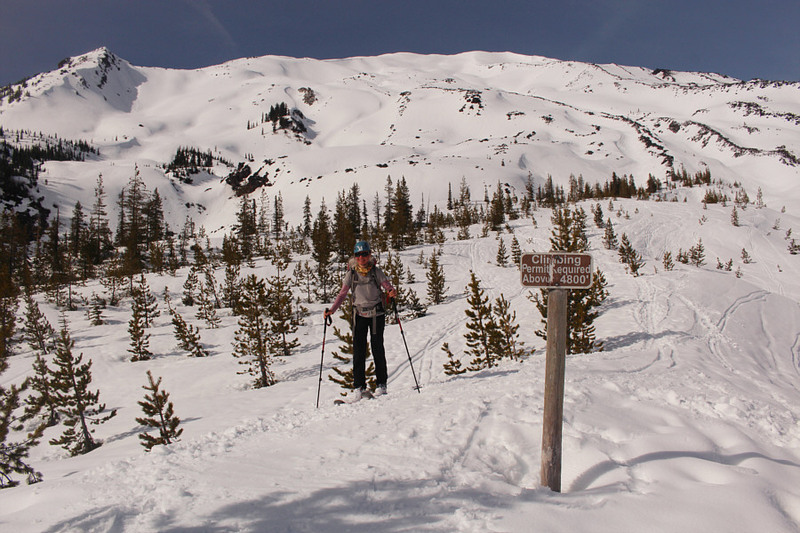 The winter trailhead is significantly lower than the summer trailhead (Climber's Bivouac) adding about 350 metres of elevation gain to the overall ascent. 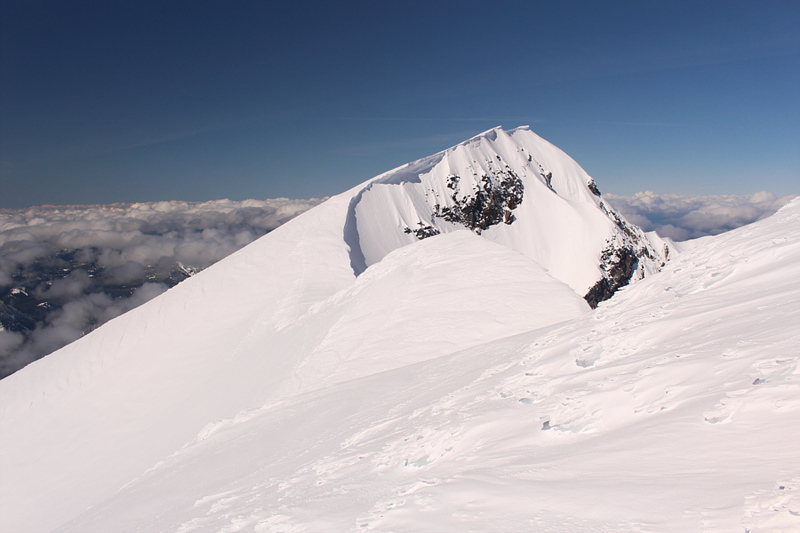 Climbers should be equipped with an ice axe, crampons and avalanche safety gear. Departing Calgary after work on 22 March 2019, Zosia and I spent the next couple of days skiing in Montana and Idaho before winding up in Kennewick, Washington. On 25 March 2019, the day before our proposed ascent of Mount Saint Helens, Zosia and I left our hotel in Kennewick and spent a leisurely day driving and sightseeing along Highway 14 on the north side of Columbia River. Late in the afternoon, we stopped in the town of Carson to fuel up and purchase a 1-day Sno-Park permit ($20 USD not including tax; cash only) from Wind River Market (Texaco). From there, we drove for another couple of hours to Marble Mountain Sno-Park. 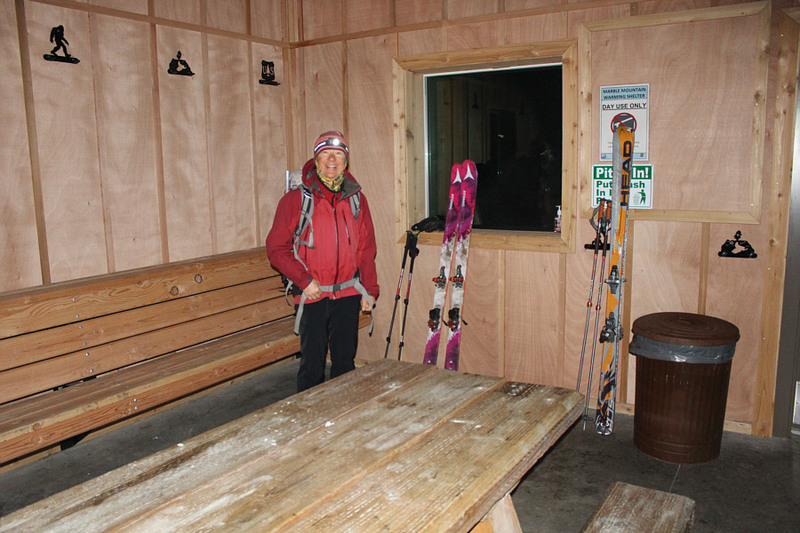 The winter trailhead boasts two large parking lots, dual composting toilets, and a spacious warming hut. While sleeping inside the hut is prohibited, overnight camping in the parking lot is permitted. When Zosia and I arrived at the Sno-Park, a steady rain was falling in the area, and the parking lot was virtually deserted except for one other vehicle. Although the weather forecast for the following day promised some light snow in the morning followed by partly cloudy skies, the steady rain was dispiriting, and we agreed that we would pull the plug on our ascent if it was still raining in the morning. Getting my car ready for bed was a bit tricky in the rain, but Zosia somehow managed to rearrange everything from the inside. To keep our skis dry, I moved them inside the warming shelter for the night. I then went to the trailhead kiosk to self-register our climb and pick up a couple of free climbing permits. Before retiring for the night, I met and chatted a bit with a father and son from the other vehicle. 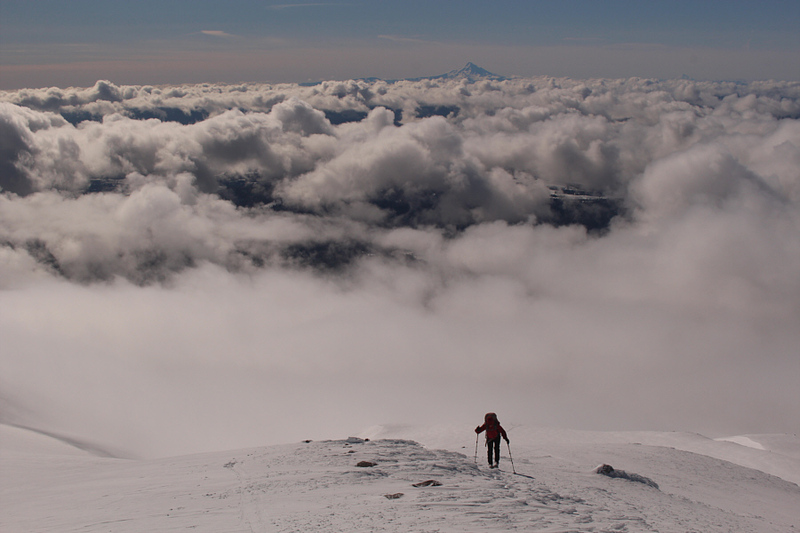 They were also planning to climb Mount Saint Helens the next day but using snowshoes instead of skis. 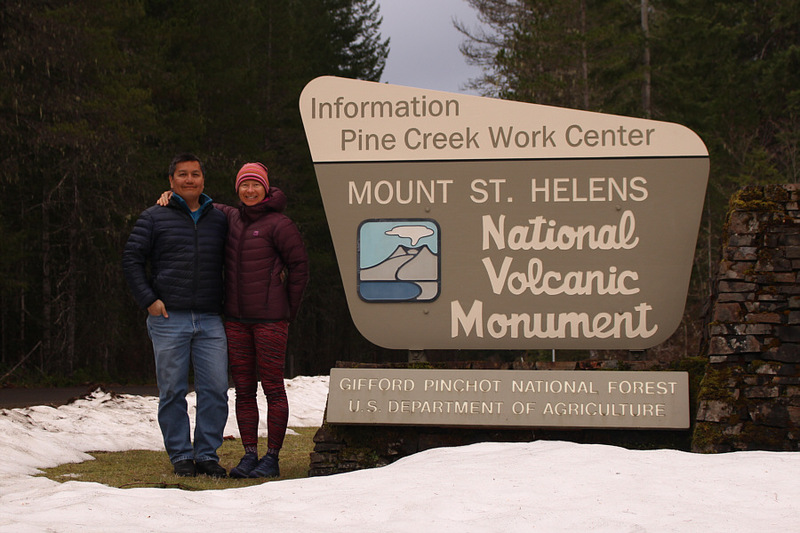 On their way to the winter trailhead for Mount Saint Helens, Sonny and Zosia stop to pose beside an informative sign. 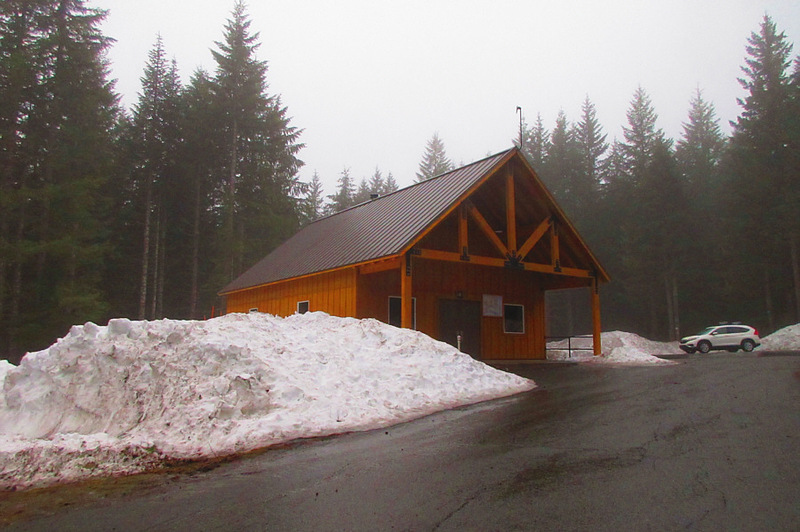 Thanks to the efforts of the Mount Saint Helens Trac Riders Snowmobile Club, the warming hut at Marble Mountain Sno-Park was rebuilt only recently after the previous one burned down in 2011. When Zosia and I awoke in the wee hours of the morning on 26 March 2019, we were relieved to hear that the rain had finally stopped. Instead, wet snow was falling, but for us, that was far better than a steady rain. As we ate breakfast and got ready inside the very convenient warming hut, there were already a couple other parties starting out ahead of us. 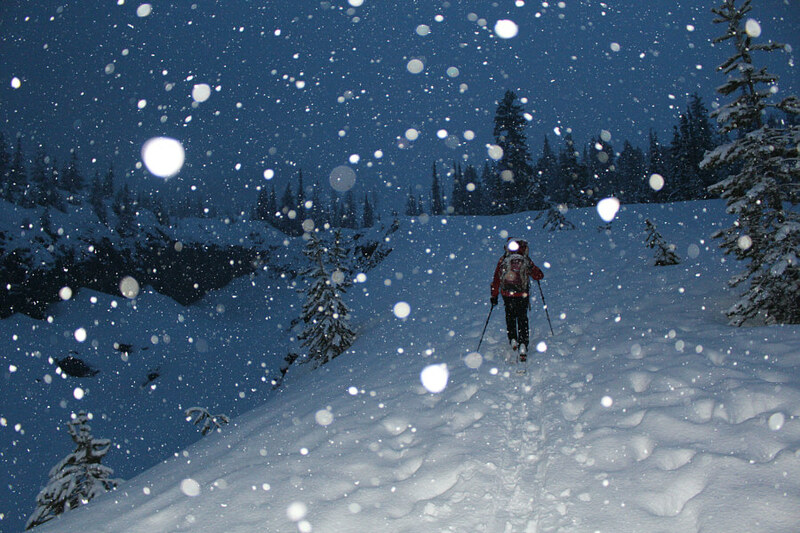 The snow continued to fall heavily as Zosia and I began skiing up Swift Creek Ski Trail #244 with our headlamps on. With the significant rainfall and recent warm temperatures, we were expecting the trail to be in poor shape for skiing, but the fresh snowfall really helped improve conditions. Signage for Worm Flows Route is pretty good, and we had no problems finding our way up to tree line. After having breakfast inside the warming shelter, Zosia is geared up and ready to go. 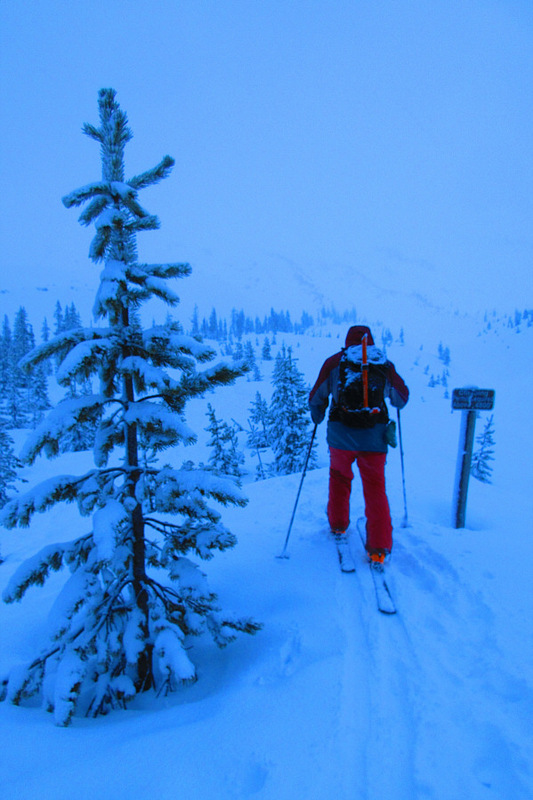 Following Swift Creek Ski Trail #244 is relatively easy even in the dark and under heavy snowfall. Sonny passes a sign along the route near tree line. Beyond the last trees, Zosia and I followed the tracks of a couple of snowshoers just ahead of us and started climbing more steeply along a rocky ridge. 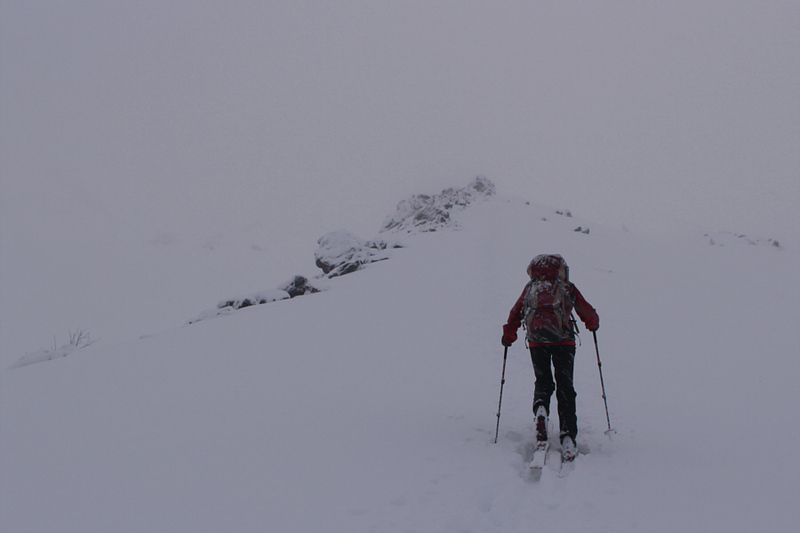 Blowing snow and low cloud cover hampered our visibility and depth perception, and at one point, I veered away from the rocky ridge in hopes of finding a more gentle slope to climb. 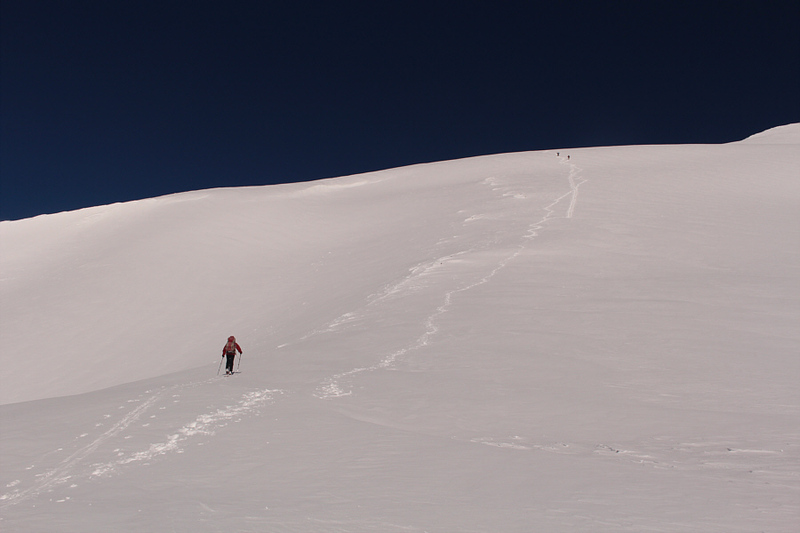 Unwittingly, I led us over a shallow cornice onto what felt like an exposed and uncomfortably steep slope. Fortunately, we were able to turn around and retreat to the rocky ridge which by now had become our only point of reference in a blank sea of white. We subsequently stuck close to the rocky ridge until we reached what appeared to be a weather station (antenna attached to a locked equipment box). A rocky ridge and tracks of a party ahead of Zosia are the only points of reference in this white void. 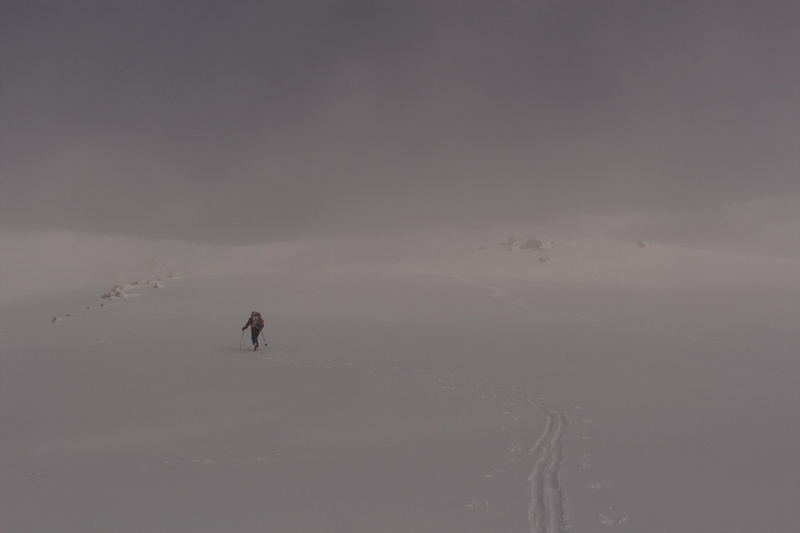 A couple of snowshoers can be seen just ahead of Zosia. Shortly after Zosia and I passed the weather station, the snow abruptly stopped, and the skies completely cleared. The weather forecast turned out to be better than promised, and it was a most uplifting moment to be suddenly bathed in warm sunshine and to finally have far-reaching views. We continued to grind our way up the open slopes and eventually passed a couple of snowshoers with a second pair of snowshoers still breaking trail ahead of us. At one point, we noticed one of the snowshoers in the lead pair climbing up a bit before glissading back down to join their partner. 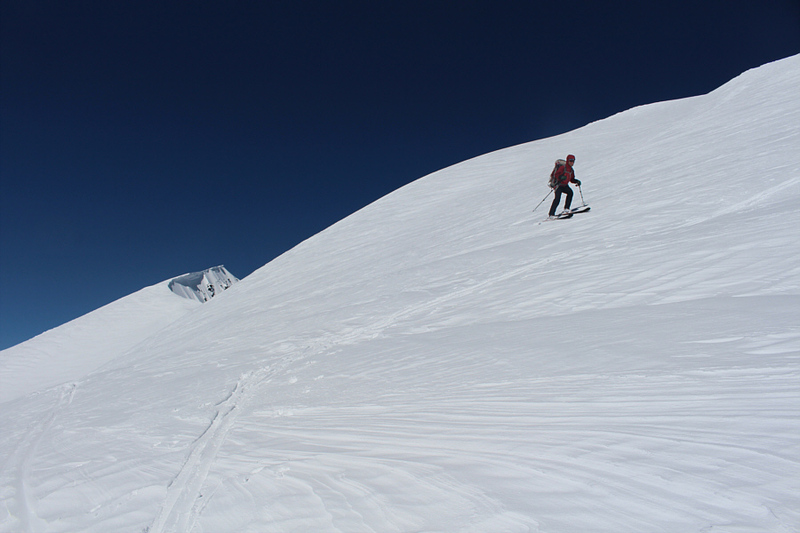 We thought that the glissading snowshoer was perhaps already returning from the summit, but then both snowshoers began climbing upwards again. 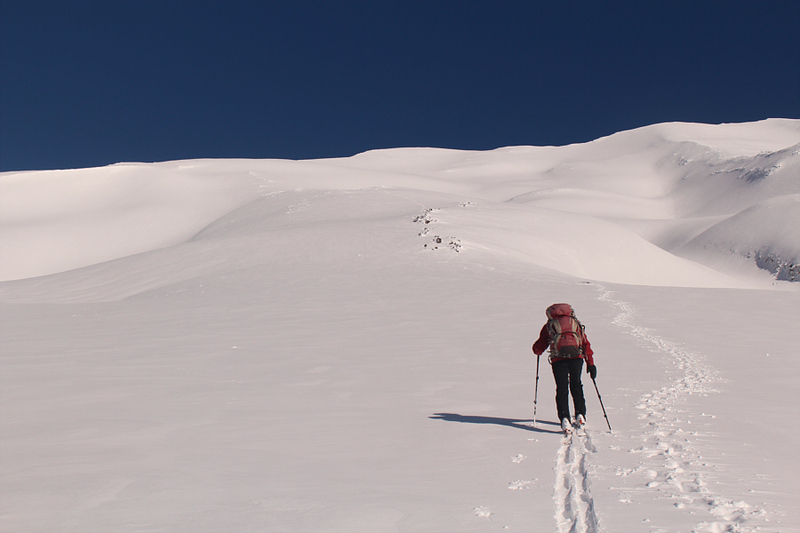 We would later learn that the non-glissading snowshoer had considered bailing on the ascent before changing their mind and continuing. When Zosia and I reached the spot where the snowshoer glissaded, we were a bit surprised by the steepness of the slope, and we found it easier to simply boot-pack this section rather than skinning up. We put our skis back on when the angle of the slope relaxed a bit. The morning sun starts to break through the cloud cover revealing more open slopes. With snow still flying in his face, Sonny looks like he is on an expedition in Antarctica. The clouds and snow disappear almost suddenly. The clouds clear enough to reveal most of the lower part of Worm Flows Route. Zosia continues to grind uphill in full sunshine. Mount Adams is already visible to the east. Clouds roll in to obscure the lower mountain. Visible on the horizon is Mount Hood. Zosia begins climbing what is probably the steepest part of the route. A couple of snowshoers can be seen higher up. One of them actually glissaded partway down the slope before resuming climbing upward. Zosia resorts to boot-packing as the slope becomes too steep to skin up. The final slope before the crater rim is fairly straightforward to climb, but before Zosia and I arrived there, we noticed that the lead pair of snowshoers were already coming back down seemingly prematurely. A quick check of my GPS showed the summit to be still several hundred metres further to the west, and Zosia and I began veering in that direction even as we continued to climb. 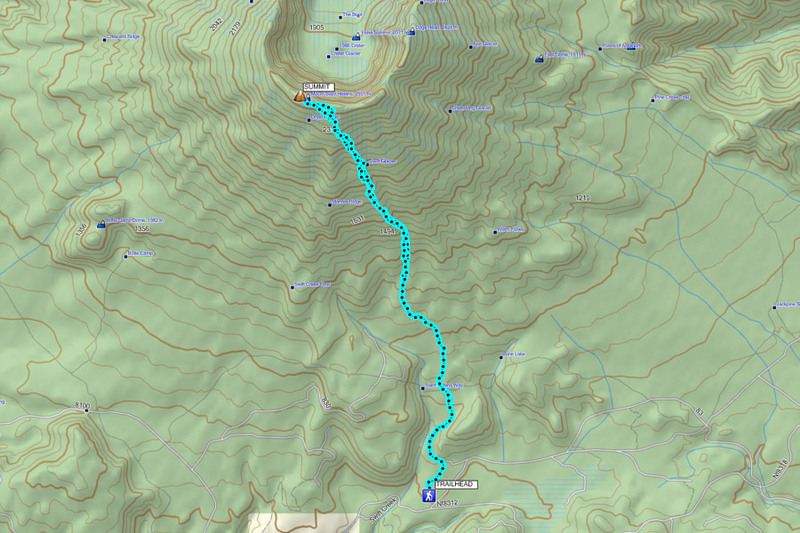 We eventually spotted the heavily corniced true summit, but getting there would require a slightly awkward descent along the crater rim and a traverse across uncomfortably steep slopes. Zosia was not comfortable with this traverse and opted to wait for me while I continued on. Dropping into the dip along the crater rim turned out to be the trickiest aspect of the traverse as I had to contend with some wind crust on a fairly steep slope. Once I got across the dip though, the remainder of the ascent was generally straightforward. 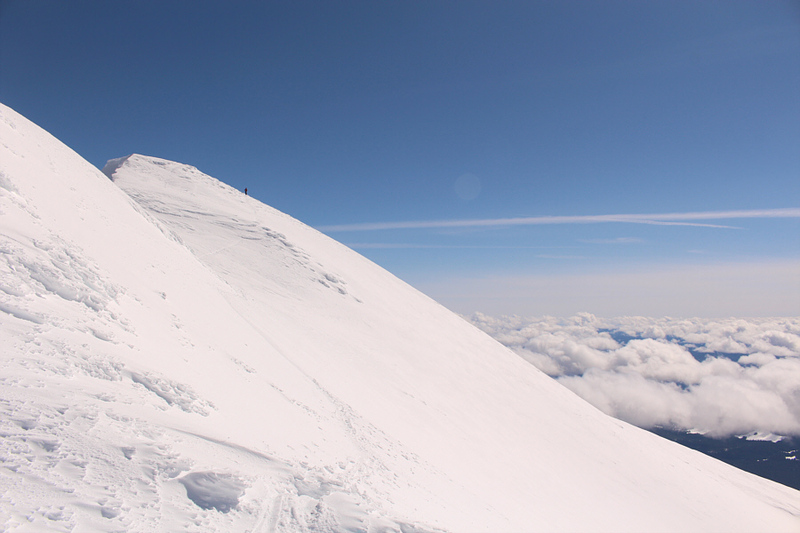 Knowing how massive the cornices were lining the crater rim, I gave them a wide berth throughout the traverse. 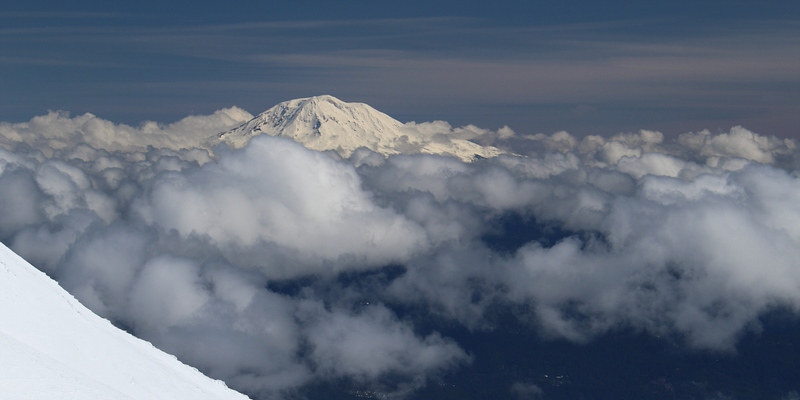 On the snow-capped summit, I did not venture high enough to look down into Mount Saint Helen's crater, but I was at least able to see both Mount Rainier and Spirit Lake. The weather on the summit was perfect on this day--warm sunshine and no wind. 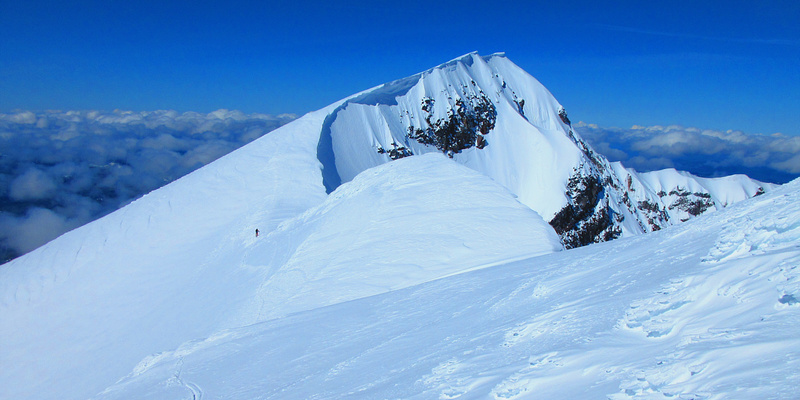 While most people ascending Worm Flows Route are content to just reach the closest part of the crater rim directly above Monitor Ridge, a somewhat tricky traverse is required to reach the true summit about 400 metres further to the west. 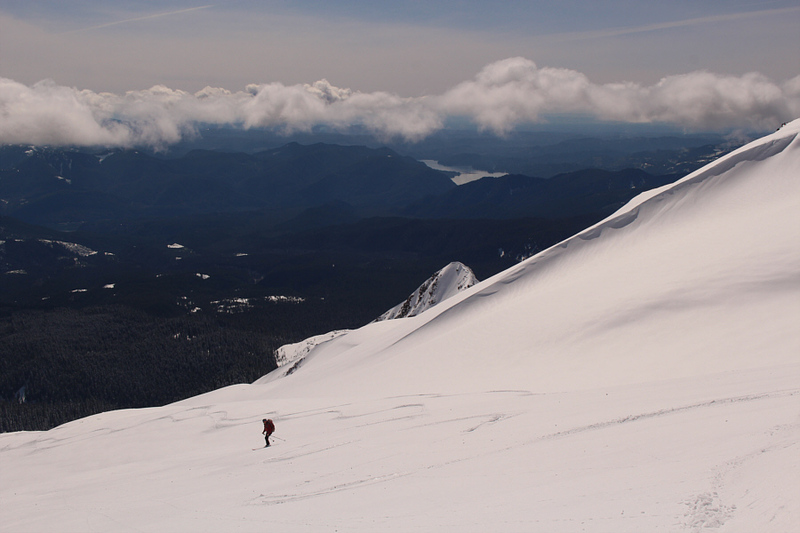 After dropping to a dip along the crater rim, Sonny resumes climbing to the true summit. This is looking back at Zosia from the dip along the crater rim. Here is another look back at the part of the crater rim that most people stop at when climbing Worm Flows Route. 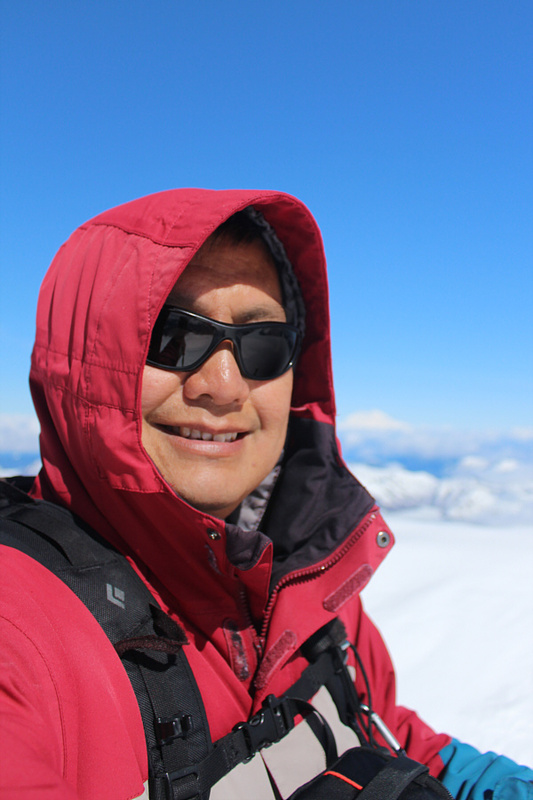 Sonny takes a selfie on the summit of Mount Saint Helens (2540 metres). 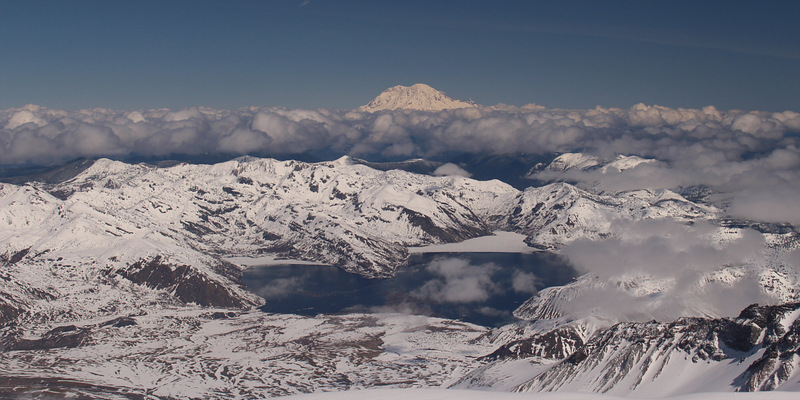 Here is the million-dollar view to the northeast of Spirit Lake and Mount Rainier. 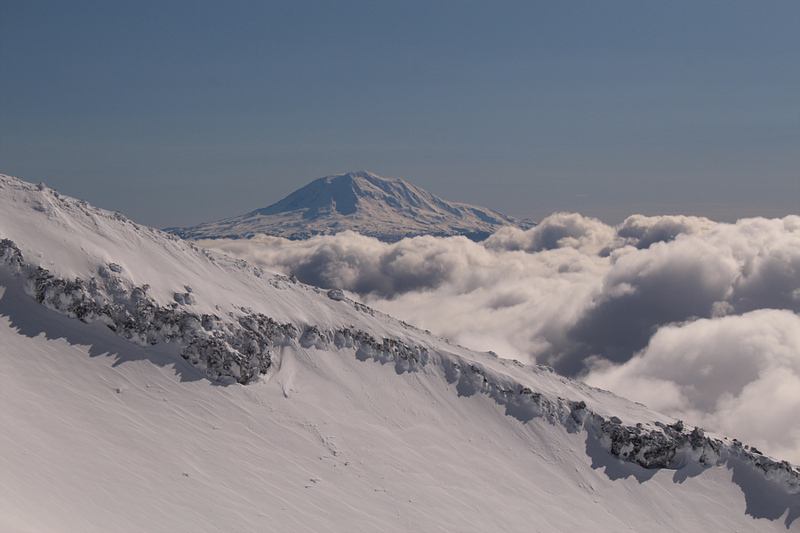 Here is the view of the eastern half of the crater rim with Mount Adams on the horizon. Distant Mount Hood rounds out the view to the south. While it would have been nice to linger on the summit, I did not want to keep Zosia waiting. After stripping off my climbing skins, I left the summit after spending less than 20 minutes there. 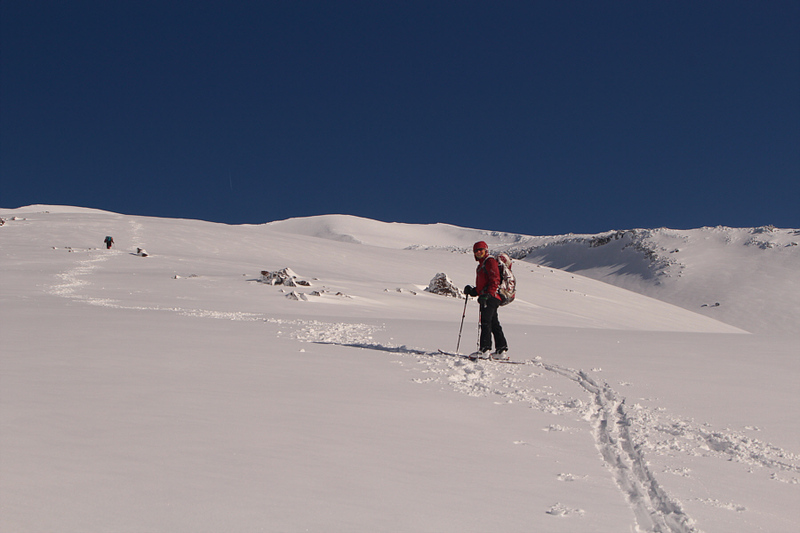 As I skied back to the dip, I noticed some figures on the next high point along the crater rim. This is the same high point that the aforementioned snowshoers had climbed (I saw no fresh tracks on my way to the true summit). It would seem that most people that climb the Worm Flows Route do not bother with continuing to the true summit. More troubling though was seeing some of these people walking or standing near the edges of the overhanging cornices, and I wondered if they were even aware of how dangerously close they were to the abyss below them. 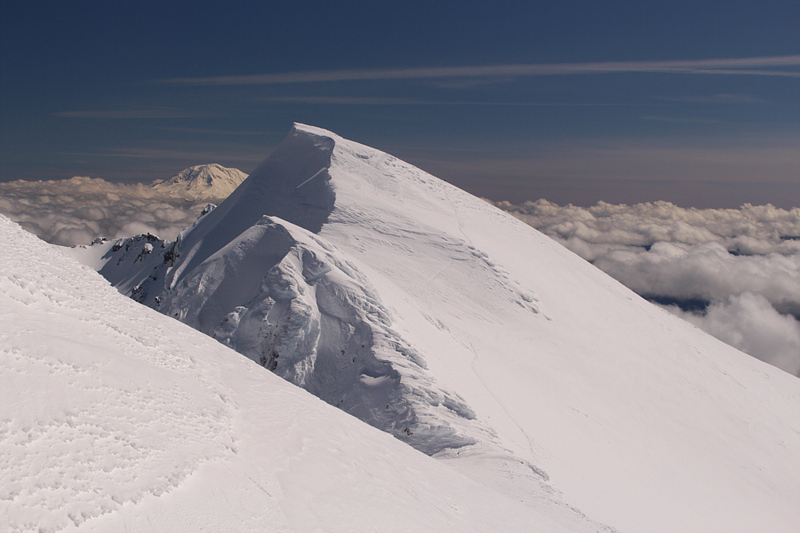 There has been at least one recorded fatality associated with a cornice collapse on Mount Saint Helens, but given the heavy traffic on this mountain, it is perhaps surprising that there has not been more accidents over the years. Rather than climb back up my tracks from the low point of the dip, I continued traversing across the steep slope and eventually wound up below where Zosia was patiently waiting for me. 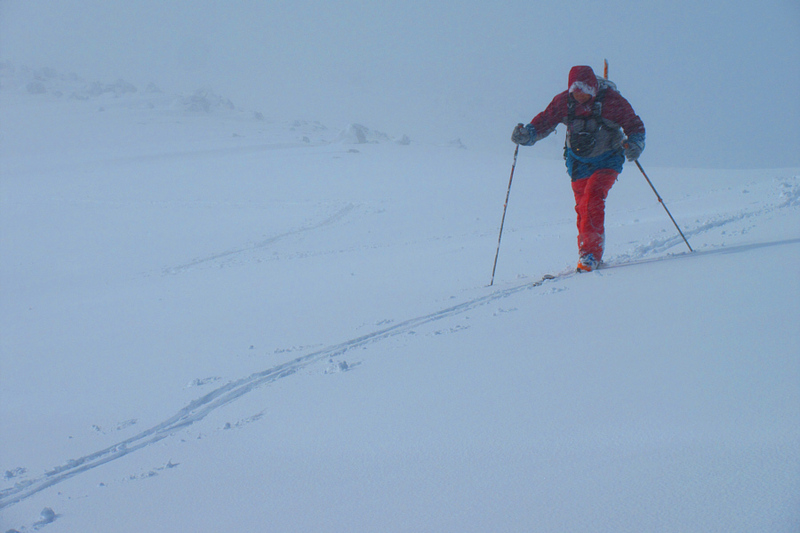 Once I got her attention, she quickly skied down to join me, and together, we continued to ski down the mountain. By now, there was a steady stream of people coming up, and the Worm Flows Route was taking on a circus-like atmosphere. Thankfully, we were going in the opposite direction and had plenty of room to make turns. 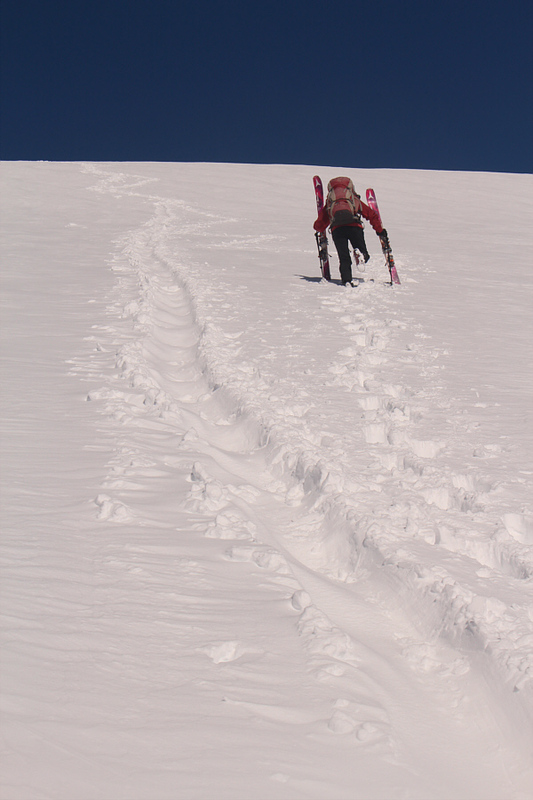 In my opinion, this was probably the most enjoyable ski descent I have ever experienced to date. 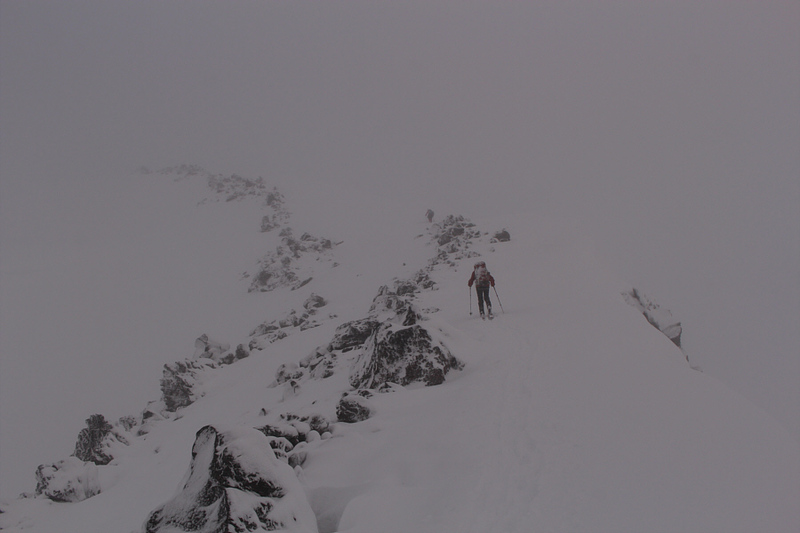 The combination of fantastic snow conditions, superb weather and moderately-difficult terrain was simply perfect. 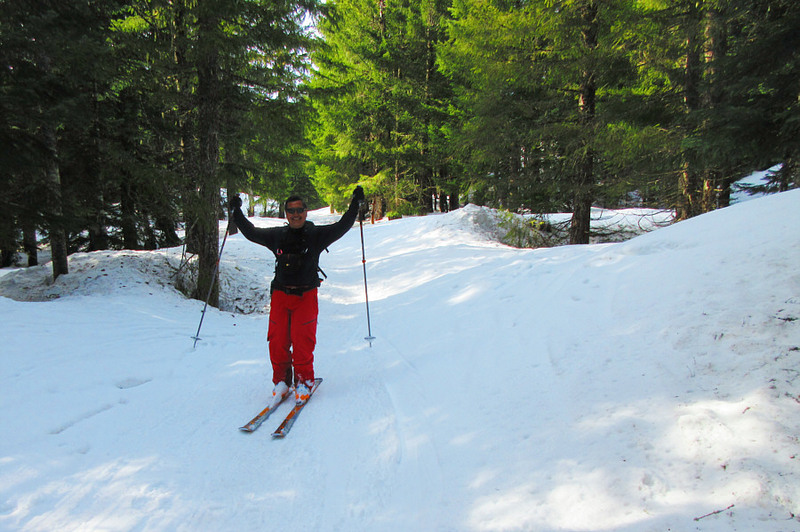 Even below tree line, Swift Creek Ski Trail #244 was a lot of fun to ski all the way back to the trailhead. Zosia was not too proud to walk down a few steep sections, but overall, she managed to ski most of the mountain, a terrific accomplishment for someone with limited downhill skiing experience. Upon returning to Marble Mountain Sno-Park which was considerably busier than the previous evening, we packed up our gear and drove west to the I-5 where we eventually found a truck stop to grab a shower and enjoy a hearty dinner. 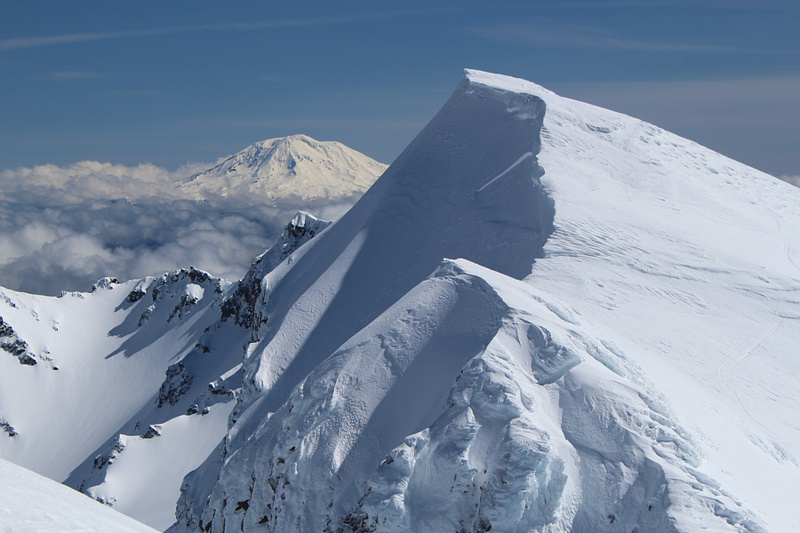 Here is a closer look at the more popular "summit" along the crater rim. Mount Adams looks brilliant in the distance. 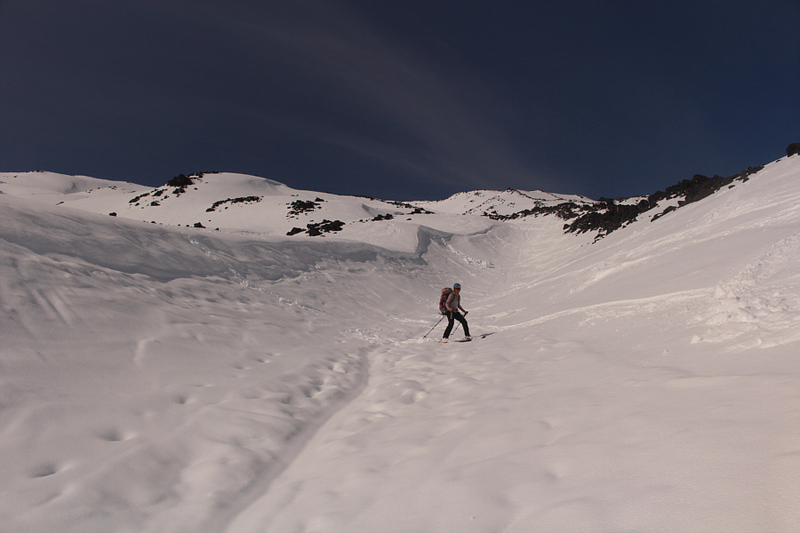 Zosia descends the slope near the crater rim. 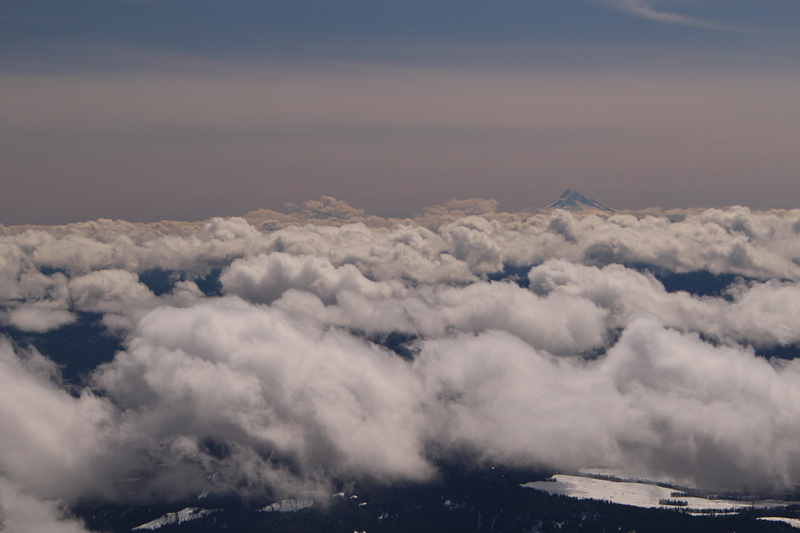 Here is another look at Mount Adams surrounded by clouds. 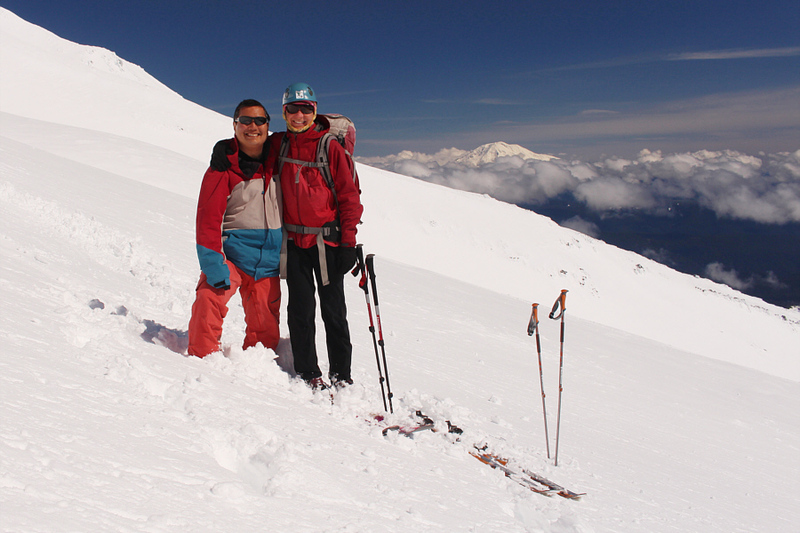 Sonny and Zosia pause their descent to pose for a photograph with Mount Adams in the background. Click here to see Sonny subsequently skiing the slope below this spot. Zosia skis down more open slopes with Yale Lake visible in the distance. Zosia skis down a gully which resembles a ski resort half-pipe. Zosia returns to the sign along the route near tree line. Visibility of the upper mountain is much better than earlier in the morning. Sonny is enjoying the long run down Swift Creek Ski Trail #244. 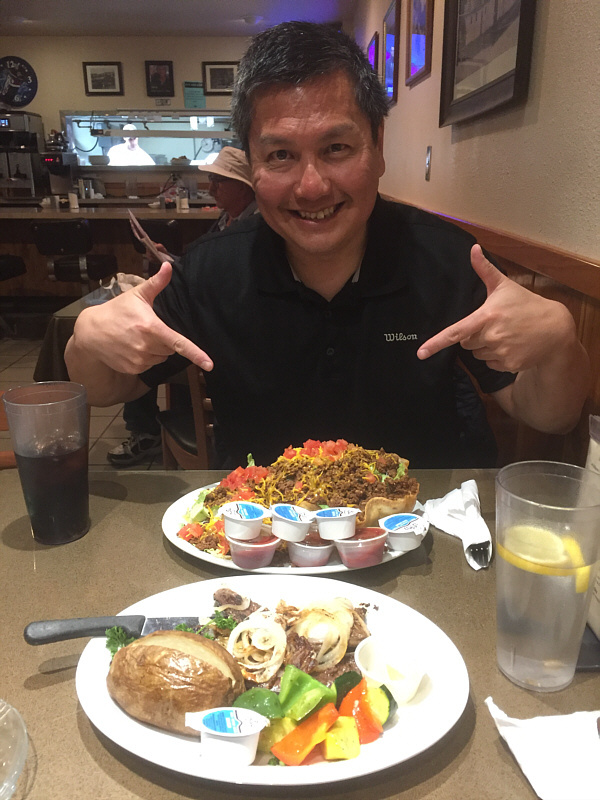 Sonny is about to dig into a monster taco salad at Gee Cee's Truck Stop.